Is it possible to fall in love with somewhere after seeing just a single photo of the place? If so, that’s exactly what happened to me when I saw a picture of the Spanish town of Albarracín in rural southern Aragón. I don’t remember when I first came across it, but at some point a few years ago as I was browsing the Wikipedia categories for all things Spain (#NerdAlert), I found this shot of the village’s old town snuggled up against canyon walls, with the buildings golden and ruddy in the warm, waning light, the church bell towers bright and colorful, and the whole atmosphere reminiscent of whatever “Old Spain” is supposed to mean. I was hooked. 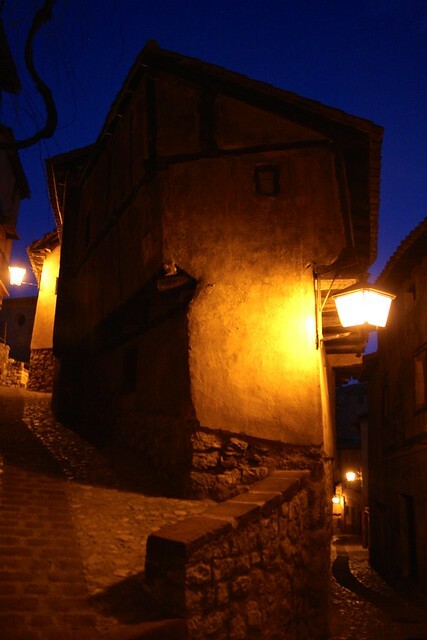 Albarracín, come to find out, is one of the most isolated places in the whole country. 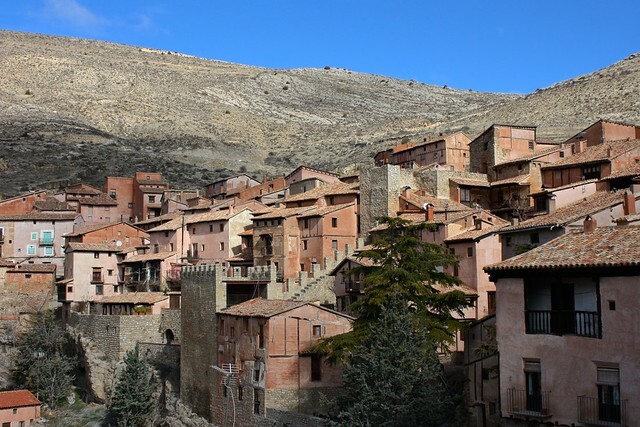 Pronounced “ahl-vahr-rah-THEEN” [al.βa.raˈθin], this tiny village is a half-hour drive into the mountains from Teruel, the only provincial capital in peninsular Spain without direct train service from Madrid. Because my time teaching English in Spain has brought me to the south of the country—Úbeda—and the far northwest—Santiago de Compostela—I thought I would have to write off ever getting a chance to see this far-flung town that had so captured my imagination. Fast forward to early 2014. I was planning an ambitious journey around landlocked, east-central Aragón, and I wanted to make sure I saw as much of the region’s unique Mudéjar-style architecture as possible. While the big, regional capital of Zaragoza is home to several churches built in this style, the bulk of the World Heritage-listed sites are found to the south in Teruel…which just so happens to be right around the corner from Albarracín. I decided to book two nights in this picture-perfect village: a dream come true. 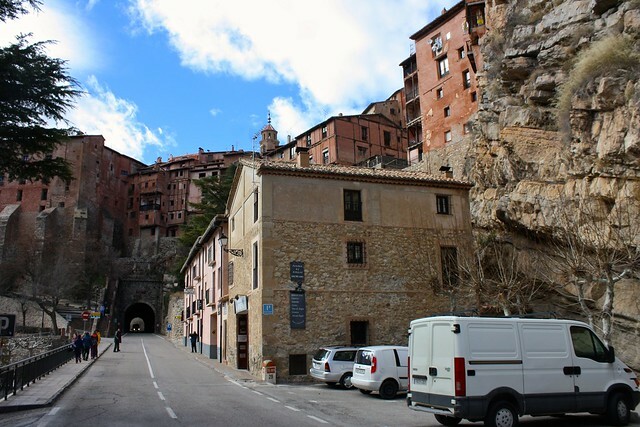 As I left Teruel in the only minibus that leaves for the mountains each day, it seemed as if I were going back in time—back one thousand years, to be precise. In the 11th century CE, as the Caliphate of Córdoba was falling into oblivion, local Muslim noblemen took advantage of the political vacuum and quickly grabbed power, forming taifas or independent kingdoms. These tiny taifas—centered around a major city—endured for a hundred years or so until a better-organized dynasty from North Africa invaded and reunited Muslim Spain: the Almoravids. 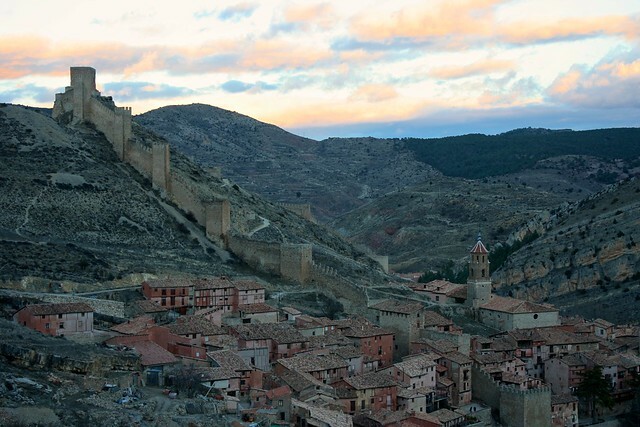 During this chaotic time period, a powerful Berber family called al-Banu Razin (“the sons of Razin” in Arabic) based their taifa in what is now the Castle of Albarracín and controlled the southwest part of modern Teruel province. Only three kings ruled until the Almoravids swept through the area, but it wasn’t long until Albarracín would enjoy another century-long period of independence, this time as a Christian lordship in the late Middle Ages called Santa María de Aben Razín. Today’s Albarracín is a heavily-restored version of the village it was half a millennium ago, as the town was essentially in ruins after the Spanish Civil War. In the postwar period, local authorities rebuilt crumbling homes according to centuries-old traditions, chose a uniform paint scheme by adding local, ruddy clay to the plaster, and re-tiled the roof on the cathedral’s bell tower in an attractive zig-zag pattern. This major investment was a big risk—but it paid off big time as tourism is now the town’s main industry. As I hopped off the minibus, the sun was finally emerging from moody clouds…and I was also greeted by an ever-so-lightly sprinkling of snow! I took this magical welcome as a good omen for the two nights I planned to spend in this charming town. 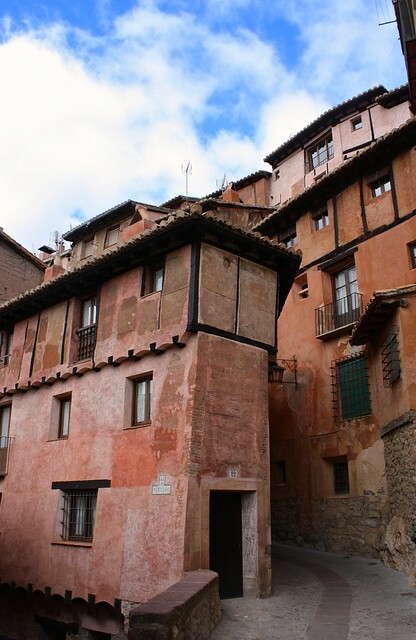 Half the reason anyone comes to Albarracín at all is to spend hours strolling around the town’s streets, which are lined with quaint homes rehabilitated to look as they would have in medieval times. Stone walls are covered in plaster that has had red or orange clay mixed in to give it the stereotypical Albarracín “look” (still waiting on an official Pantone swatch…) and dark brown wooden beams give structure and that Old World charm you often see in German or Belgian villages. Iron grating graces windows and balconies, while speckled, curved tiles make sure the rain falls in the streets, not in bedrooms. It’s impossible to get lost in such a small village—especially one built on a hilltop so you have elevation to help you out—so I spent a lot of my time wandering back and forth across town, finding out which paths took me up to the cathedral and which ones emptied out at the river, running into the same stray cat multiple times, and creeping on restaurant menus as I waited for the clock tower to strike eight at the Plaza Mayor. In such a minuscule town of barely 1,000 inhabitants, there’s admittedly not much to cross off your checklist here. 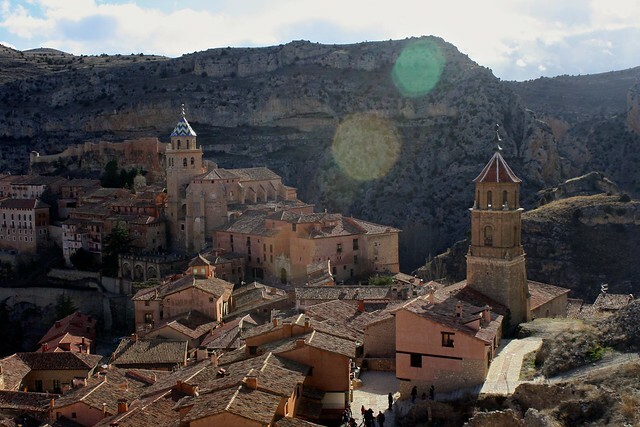 But if you speak with the tour guides at the Fundación Santa María de Albarracín, you can easily organize a private guided tour of the city and various sights for a couple of euros. Albarracín’s most stunning monument is the cathedral, a stone’s throw from the main square. A mixture of late Gothic and Renaissance styles, the small, squat church rests on huge, buttressed foundations that reach yards below floor level. The interior is currently being restored, but you can still appreciate the ceiling’s delicate Gothic tracery and the brilliant, gold-everything-everywhere Baroque side chapel. 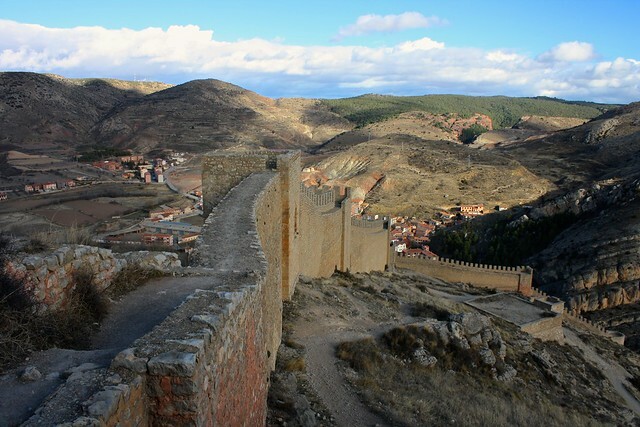 Albarracín’s castle occupies the core of Muslim al-Banu Razin’s medina or Moorish city. While the castle’s walls are mostly reconstructions, the grounds are an archaeological site that has yielded a lot of artifacts, which you can check out in the city museum. Nevertheless, I found it difficult to imagine the Islamic baths and palatial homes my tour guide described; there just wasn’t very much at all to look at here apart from ruined foundations. But because the castle is situated on top of a peña or rocky hilltop, I was able to get some amazing shots of the town from the northeast defensive tower (see the post’s first picture above). While I was so glad to finally see this most beautiful of villages, two nights was one night too many to spend here. I was forced to book two nights since the once-daily bus arrived from Teruel at 3pm and departed for Teruel at 9am—hardly enough time to really do the town justice. Admittedly, you can walk from one end to the other in ten minutes, but still, half a day just didn’t seem like enough. I was stuck with the problem of too much time instead of too little. So I passed the hours away simply wandering around town, enjoying the endless variations of pink, orange, and brown walls—but I also went up the hillside quite a few times. The Torre del Andador (“Walker’s Tower”) stands guard on top of the hill outside of town, and commands a dozen defensive towers that punctuate the city walls on either side of the hill. 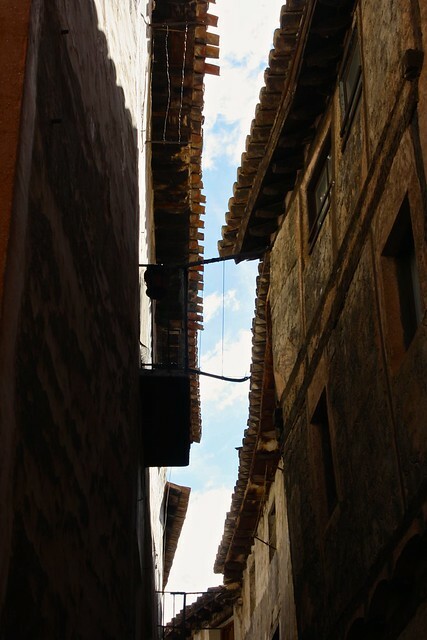 Part of what makes Albarracín so gorgeous are these grand walls that swoop up the hill from ground level, culminate at the Torre del Andador, and then fly back down. It’s surprisingly easy to climb up to the main tower by following the trails or simply scrambling over boulders. I nearly got blown off one of the side towers when the extremely-powerful winds shifted—there are no guardrails and the walls aren’t crenellated (i.e., the poky bits to hide from King Arthur and hurl French insults from), so it’s basically a free-for-all up there. Sorry, Mom! Walking further out to the west from the top of the hill, I got the chance to appreciate the “flow” of Albarracín, the strategic defenses to the north and the residential core to the south. From this vantage point out by the Ermita del Carmen, a lonely hermitage dedicated to Mary, I pondered how this isolated outpost was once the center of two diminutive little kingdoms. 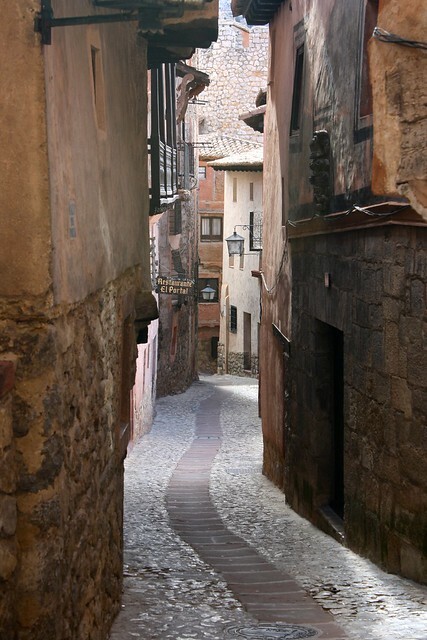 Albarracín, like Aragón at large, is a very meat-and-potatoes kind of place. The province’s dry, windy climate makes it a perfect setting for naturally curing legs of ham—jamón de Teruel—which are perfect served on their own, but you can also order them with some bread, cheese, and sausages to complement the rich, fatty flavors. To warm you up on those cold winter nights, I recommend ordering huevos rotos con jamón: eggs are served sunny side up and “broken” with the yolk oozing out over potatoes and strips of Spanish ham. Another option is ternasco asado, roast lamb meat that is so juicy and tender you don’t need much more than fries and a side salad to finish the meal. 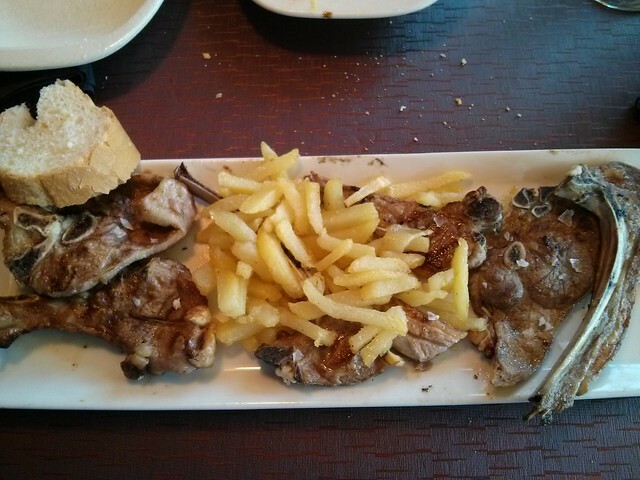 Ternasco is a denominación de origen (protected regional variety); the Aragonese people take their roast lamb seriously. It’s a must-try dish! I was most struck by the sheer emptiness of town, especially at night. I arrived near the end of winter, and apparently most of the homeowners actually live somewhere else and only stay here in the summer. Most of the tour guides lived in Teruel or elsewhere, as did the manager at the hostel I slept at. 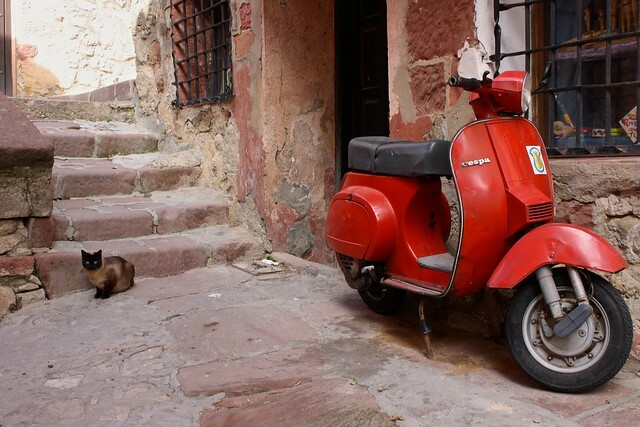 I’d be willing to bet that I came across more stray cats than real-life albarracinenses, and only a handful of houses had their lights on at night as I wandered around, hungry, waiting for restaurant kitchens to open. I was hard-pressed to find an actual corner grocery store or mini-mart, and I had no idea where locals or restauranteurs got their meat and produce—unless they drove out to the new town at the bottom of the hill. 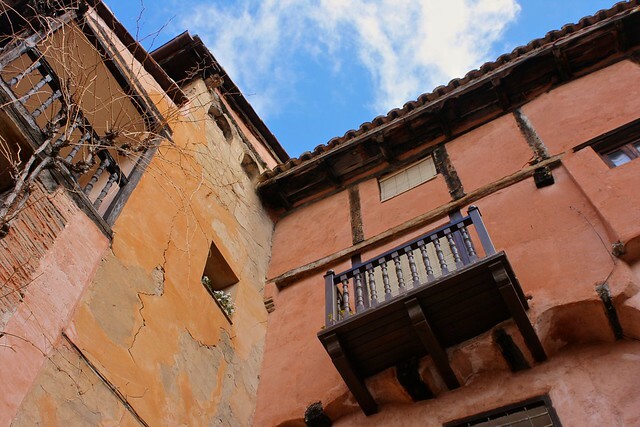 Perhaps Albarracín is a fun-loving, vibrant place to summer in, but when I visited I found the place dead and empty save for fellow tourists and the handful of folks running hotels, restaurants, or tourist sites. 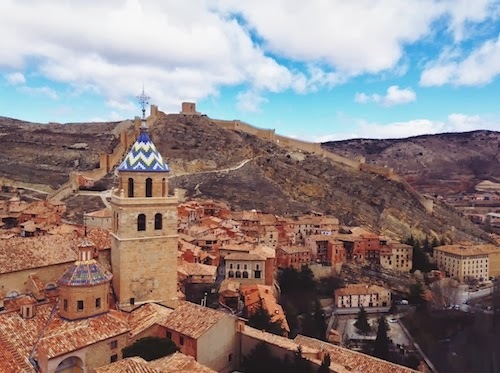 It’s a shame a village as beautiful as Albarracín was so lifeless, but fortunately this medieval gem has been well taken care of and not lost to time. 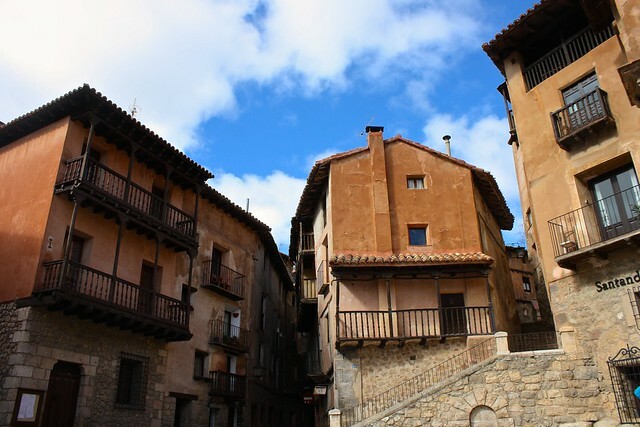 Albarracín is perched on top of a mountainous meander of the Guadalaviar River near the provincial capital of Teruel, about 3-1/2 hours due east from Madrid by car. Getting to Teruel by bus isn’t too difficult, but its train station is only a brief stop along the Valencia-Zaragoza train line. From Teruel, catch the Navarro bus to Albarracín around 2pm. To return, wait at the bus parking lot downhill by the highway a little before 9am—but double-check with the tourist offices as the hours for the sole departure per day can change. Have you been to Albarracín? What do you think is the most beautiful village in Spain? Give me your nominations in the comments below!